The Needlepoint Ivy Plants are excellent lawn alternatives. Tamer growing than the English Ivy, Needlepoint Ivy is an evergreen ground cover that controls erosion, is drought and salt tolerant. Hedra helix Needlepoint remains under 12 inches tall and is mostly low maintenance. 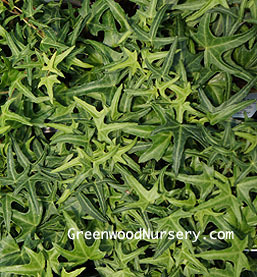 The interesting shape of the leaves makes it a good choice for topiary plant projects. As with other ivy plants, the ASPCA lists it as toxic to dogs, cats and horses. For more information on toxic and non-toxic plants visit ASPCA. Needlpoint Ivy ships in 3.5 inch pots. Cannot ship to Oregon or Washington.